History of Radio Controlled Cars | Classic and Vintage RC Cars History of Radio Controlled Cars | We are an internet source for classic RC car pictures and information. From vintage vehicles to pre-modern sports cars, you’ll find it here. To give a brief overview of the history of model car racing we should begin in the early part of the last century. That may seem a long way back but by the 1920s organisations were already running events for clockwork cars. In 1936 the Model Car Racing Association was formed in England and catered for rubber drive cars, as well as clockwork. 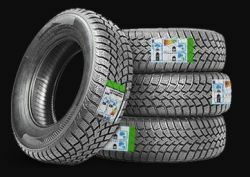 It may well be worth pointing out that a 4WD rubber (band) drive car could accelerate to 40 mph in under 3 seconds, the weight of a car would typically be 3 pounds half of which could be the rubber. The cars would be released and run in a ‘straight’ line to the finish. Within a few years, in America,miniature petrol engines were being put into cars, but a greater need for control was required. Circular cable (tether) tracks were built and by 1940 speeds of 60mph were being achieved. The American cars tended to be manufactured as kits by such companies as Dooling Bros and Ohlsson & Rice. Meanwhile, in England, there appears to have been much more reliability on the engineering skills of modellers and scratch build cars were much in evidence. Today tether cars from this period have become collectors pieces and can change hands for not inconsiderable sums of money. One short coming of this type of racing was that only one car ran at a time, against the clock. A desire to run races with multiple cars, coupled with the emergence of small engines, of 1 to 2.5cc, resulted in Rail Tracks and Rail Cars. The track would consist of I section rails and the cars would sit over them, one car per rail, guided by ball race carriages. www.britishpathe.com have some film of both tether and rail cars, search for model cars. Some of the cars from this period are arguably the most elegant model racing cars ever produced. Tether car racing continues to this day and they are the fastest model cars of all. From internal combustion rail cars came electric rail cars and from these, my research would suggest, came slot cars. Radio control of vehicles was possible by the mid 1950s but it was rudimentary and commands sent to a vehicle would allow it only to turn fully one direction or the other. By the mid 60s radio control units were available that gave proportional control, steering inputs could be precise and throttle control possible. Finally after nearly half a century the dreams of model car enthusiasts of being able to race wheel to wheel around a track were about to be realised. Pioneers made 1/8th scale pan cars using .19-cubic-inch 2-stroke model airplane engines. In 1966, an Italian company, Elettronica Giocattoli, produced the first remote-controlled car, a Ferrari 250LM. They followed it up with a Ferrari P4 two years later. 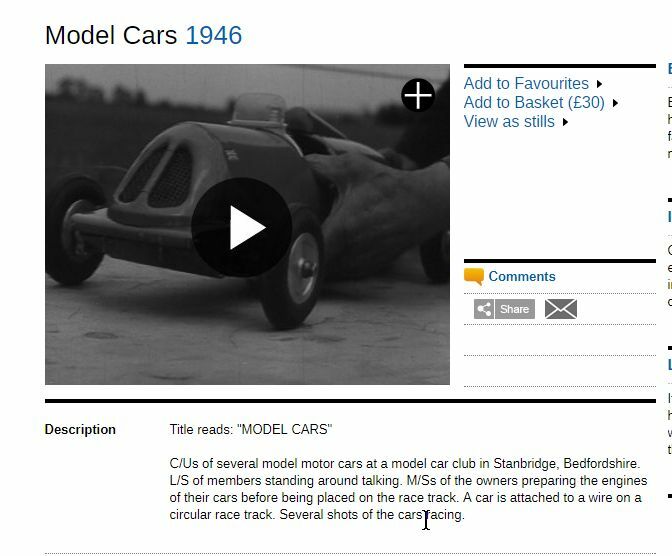 These model cars were imported into British stores, and it was not long before UK companies got into the act. 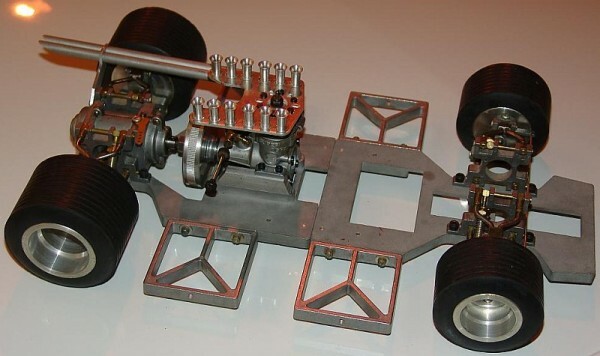 By the 1970s, British companies like Mardave produced its own nitro- or gas-powered RC cars. Around 1967, companies like WEN, Model Car Enterprises, Dynamic Models, and Associated started to produce car “kits”. 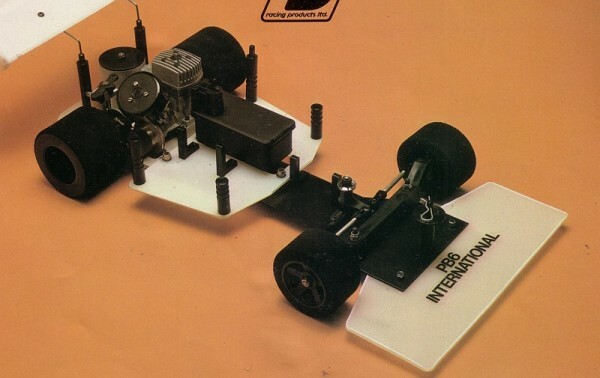 In 1979, Geneva held the first 1/8th scale On-Road Gas World Championship. Phil Booth, from England, was crowned World Champion driving a PB Racing car. The design of the cars varied considerably. Some were quite intricate and had in line engines connected to operational gearboxes and had basic suspension. Others were simple flat bed (pan) chassis with sidewinder engine configuration driving directly on to a gear mounted on the rear axle or on to one of the rear wheels. Almost all had centrifugal clutches, this was to become a ROAR requirement, but Dynamic produced a car that had a torque converter with epicyclic gears operated by a lever, to provide drive. Over time, maybe as a result of engines producing more power but more likely by the cost of manufacture, chassis design began to move toward the flat bed/sidewinder type. By the mid 1970s flat beds reigned supreme and would do so until 1980. As with most forms of motor racing, a successful design is very quickly appropriated by rivals and cars become very similar looking. By the mid to late 1970s chassis design consisted of a fiber glass main chassis plate coupled to a metal (aluminium) power pod to mount the engine and rear axle. A radio plate sat above the chassis on blocks, the 125cc fuel tank located here as well. The radio plate could be tightly mounted to stiffen the chassis or secured by rubber grommets with screws through them for a modicum of adjustment. Gradual refinement brought ball bearing live axles, disc brakes rather than a metal band rubbing on the clutch drum, flip top plastic fuel tanks, differential rear axles and tuned pipe exhausts. The flywheel/clutch units got smaller and PTFE shoes were used. Slide carburettors, with huge bores, replaced barrel carbs and independently mounted front axle blocks, rather than the solid beam front axle, meant camber and/or castor angles could be adjusted. The evolution of this type of chassis was halted in 1980 by the introduction of the first of the new suspension cars and an era of model car racing had come to an end. Actually that last bit is not quite true as flat beds are still made in Italy and France, www.rc-contact.com, but it sounds romantic. In 1976, the first purely electric remote-controlled cars reached the market. Possibly the most famous remote-controlled car manufacturer was the Japanese company Tamiya, which in 1976 released the electric Porsche 934 Turbo model. Tamiya also made waves in 1979 when it released the Sand Scorcher and Rough Rider, two dune buggy models that could go off road. When enthusiasts were no longer limited to paved roads, remote-controlled cars were poised to take off in the 1980s. In the ’80s, American companies like Losi, Associated Electronics and Latrax (Traxxas), as well as Tamiya and Kyosho in Japan, continually introduced innovations in radio-controlled model-car designs.